Preparation Plus Presentation Produces Profits. Selling a home the RIGHT way is not for the faint of heart. It takes hard work. It takes dedication. It takes planning. It takes the entire Psychological Approach to produce profits for sellers when selling a home. When we help our clients sell a home it is like painting a picture. You want the buyers to envision themselves living in your home. How we do this is by strategically crafting a theme for your home, both Visually and through a Property Story that is engineered to create an Emotional connection for potential purchasers to buy your home. When I meet with clients who want to sell their home, I try to come up with a theme and 3 Emotional Benefits to present your home to purchasers. (As documented in our Book, Fundamental Strategy #2 “The Rule of Threes.”) If the Rule of Threes is followed and the Benefits to purchasing your home are clear to a purchaser or better yet, multiple purchasers, then the barriers of price are Thrown Out the Window. Sellers have a hard time seeing the final product that we want to present when we initially meet because they are too close to the situation. But once they watch the process unfold it is a thing of beauty to see as their eyes light up and see that light bulb go off. “Ahhhh that is what Eric was talking about the entire time.” The Story, if you will, that we tell about your home comes together and is presented in such a strategic way that potential purchasers have no choice but to feel emotionally attached to your home. Remember the dude with the Afro that was on TV painting and telling Stories while he painted? 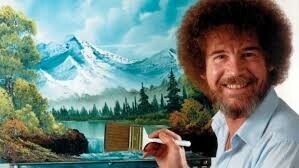 I had to Google “Dude that painted with an Afro.” Well his name was Bob Ross. The process is not always pretty. You’d have no lue how he got there. But Bob knew all along how the painting would turn out and you didn’t. This is the same thing that we do with your home. Sellers always want to tell you how ‘their house is different and better than the one down the street.’ And that might be true in some instances but, most likely, it’s not. Because that house has other features that you don’t have and vice-versa. However, each home does have a certain vibe and ‘Story’ to it that we try to enhance during the ‘Pre-Production’ process. Yes, I just made a new term while writing this Morning’s Musing, but think about it… Your home, when we unveil it to the public. When we share it’s Story. When we allow potential purchasers to see your home. This is a Theatrical Event where the public will come and give you immediate feedback on how you have done in properly preparing your home. Anthony is doing a play in theater right now, he is performing ‘High School Musical’ and the performances are set for the 2nd week of January. Want to know how long they have practiced for the show? Since August. Hundreds of hours of ‘Pre-Production’ preparation for a 2-hour show. Four and a half months getting ready for the ‘Big Day’. Making sure everyone knows their lines, knows their moves, knows how to act on stage to get the set prepared. Think of your home in the same manner… Preparing for the ‘Big Day,’ when you go ‘Live’ and potential purchasers can – Your Audience – can come see your home. If done correctly, there will be an immediate Emotional Connection between purchasers and your home. There are specific steps that we take to overcome the barriers of purchase. Most of these steps are done in the ‘Pre-Production’ of your home. First one is an investor that has nearly 200 homes in his portfolio. He buys properties and then fixes them up and rents them out and when the tenant moves out he either sells for a profit or continues to rent until he can sell for a profit. He had a townhome in Frederick that he was trying to sell with another agent. The other agent did nothing in ‘Pre-Production’ to prepare the home and when he attempted to sell the results were pathetic. He had very few showings and was unable to get an offer on the property in over 2 months on the market. Quickly had to do Pre-Production on the home. Get it ready for ‘Show Day.’ This process was compacted but we did what was necessary in this townhome in about 2 ½ weeks. The results… 8 showings in 12 days and a full-price offer. The heavy lifting work was complete in Pre-Production. The next 2 examples mirror each other so closely that I’ll combine their Stories in the sake of space here. Two sellers, both young couples having bought their first homes through me, decided it was ‘time to sell.’ One was moving out of the area for a job and the other wanted to move up to a bigger home as their family is growing. Both needed Maximum Profits to accomplish their goals. They contacted me a few months ago as both sellers knew and had read about the process we go through with each Seller to properly prepare their home. They spend about 2 months in Pre-Production. Painting, Sprucing-up, Cleaning, De-cluttering, Scientifically Staging (with Shari’s consultation). I went to their homes multiple times during the process to give pointers to help mold the ‘Story’ that we wanted to ‘Paint’ for their homes so that we could Engineer Emotions to potential purchasers. Everyone sees the end result… That these homes were ‘On the Market’ for 4 and 8 Days Respectively. That one got multiple offers. That one got over full price while the other got a full price offer… and ‘the public’ thinks, man that was easy. They listed their house and then got contracts in 4 and 8 days. The agent made ‘easy money’, the sellers were so lucky. What the public doesn’t see is the MONTHS of PREPERATION, the ‘Pre-Production Process’. The Public, all they see is the final play, they don’t see the sacrifices that the sellers made. The hard-work. The late nights preparing. The weekends, not going out, but getting their house ready. This is why I tell Everyone… Selling a home stinks… Selling a home correctly is even more difficult. But the end results are worth it! Like Bob Ross painting a picture… Like Anthony preparing 4 ½ months for a 2 hour show… Selling your home is an Event. Engineering Emotional Attachments… It is Choreographed months in advance.